Receiving your TV reception via Satellite is becoming increasingly popular to caravaners travelling this great country. 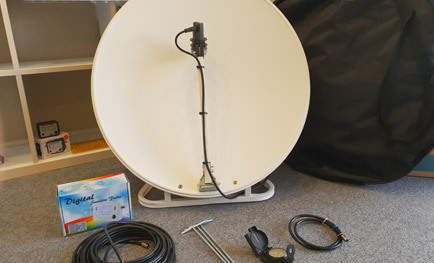 Many are finding the Satellite service more reliable and often quicker to setup than a traditional terrestrial antenna. The costs are now similar to a built-in antenna like a Winegard or Saturn terrestrial antenna. The VAST satellite service provides most channels that are available on the normal terrestrial service with sharper pictures and a more reliable service. There are local news services also available from WIN & SEVEN – more information can be found on channel 4 from your Satellite Decoder. Can we use use our VAST Satellite dish to get Foxtel? The Foxtel transmission comes from the same satellite, so once you are set up for VAST you are right for Foxtel too. To get all Channels you will need to run two cables from the satellite dish to the Foxtel Box. If you are using Foxtel and VAST at the same time some additional wiring may be required inside the van to be able to switch between the two different services. Our staff are able to help you to get the best out of your system. Can you record the TV programs? Yes, In most respects, once installed, a VAST decoder works the same as if you had a digital TV set top box connected to your television. You can watch the digital channels and can, by use of a USB hard drive, record those channels. Once you have your satellite decoder, a satellite dish and necessary cabling, there are no additional fees associated with the Satellite Service. You may however like to invest in a Satellite Finder to make finding the satellite easier as you travel, however we have full kits available at very reasonable prices. Are there Rules and Regulations or ongoing fees? The VAST service is free and there are no ongoing fees, there are some rules. You do have to register for the travelers VAST service every 6 months. If you are in a different state it is good to advise VAST so that it will provide programs on the correct time zone. There are no further regulations but a couple of things you need to be aware of. Firstly, once authorised the decoder will constantly receive what we would refer to as a ping from the satellite that keeps it activated. If your box is disconnected, for say 2 weeks for example, then the box may require reactivation. This involves going the VAST web site to reactivate the decoder by entering your smart card number. You’ll need to make sure the decoder is plugged into the satellite for reactivation. There a choice of 2 brands of VAST decoder boxes. They are UEC and Satking – both designed for travelling and home use. Should you require more information about VAST please contact our office.